When the rebel group MNLA launched its first attack on 17 January, their Parisian supporters made some rather extraordinary claims: that it had captured the large town of Menaka, that a number of Malian soldiers had been killed and vehicles had been destroyed. Press phone calls to residents of the town cast grave suspicions on the rebels claim to have held the town at any point, but the remoteness of the battlefield has left outsiders with only the unsatisfactory, equally decisive if opposite assurances from the Malian armed forces. Amongst the most extraordinary claims, repeated by Paris MNLA supporters as recently as the 27th, is that the lightly armed rebels shot down a MIG fighter jet and a helicopter. Impressively, a photo which was said to be rebels casually posing with a downed MIG, appeared on the 25th. 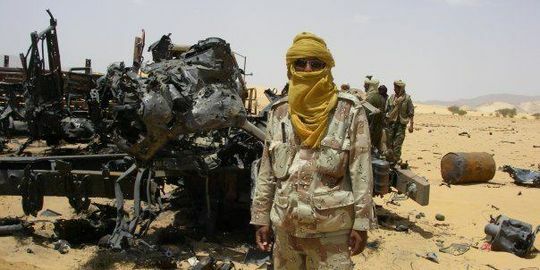 We now know the “proof” that rebels shot down a Malian MIG is a hoax. I suspected this upon seeing it. It was made of large steel beams, rather unlike aircraft. 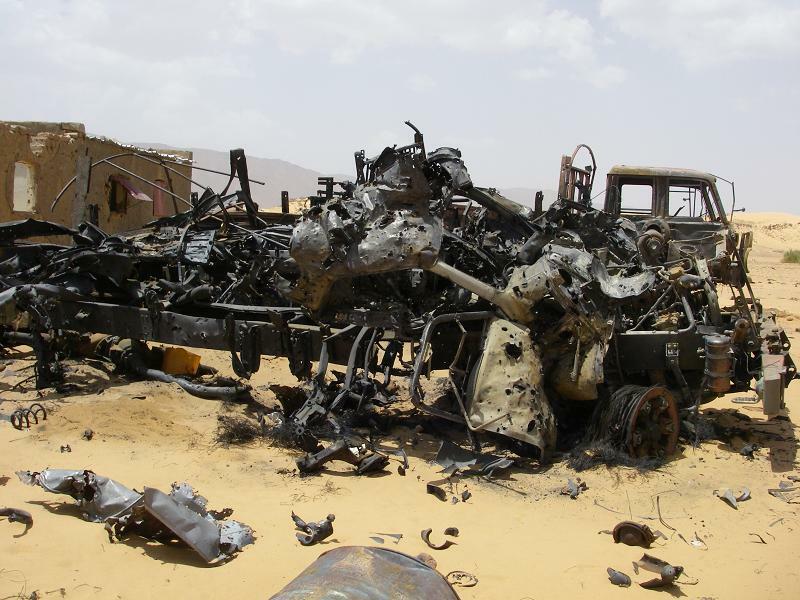 A little digging lead me to a now defunct Nigerien rebel group’s photo of a burnt Nigerien truck from 2008. It’s unfortunate that the same group of French and Belgian based rebel supporters, through an interlinked blog, publicized the original 2008 photo at that time. It’s later use in French based Le Monde and Jeune Afrique has since catapulted the photo into general usage. Here is the 2008 set of Mouvement des Nigériens pour la justice, publicized by a prominent supporters’ blog. 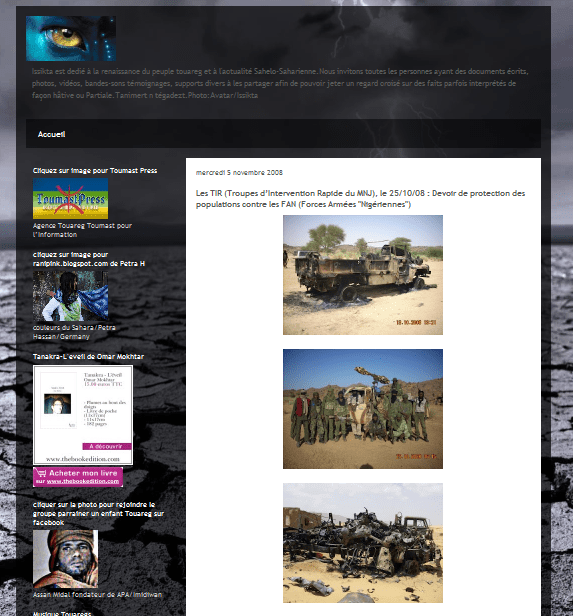 Here’s the 2012 “Malian MIG” photo. It does not seem accidental that the photo chosen includes a man obscuring the remaining portion of the truck cab. Notice he does not obscure the front bumper or the heavy mid-frame of the truck. This never looked much like an airplane. Who used it first? Who knows. Only the first person to use it can say from where they got it, and why he gave it a false caption. It seems to have also appeared on this guy’s Facebook page on Wednesday 25 January, with a caption claiming it was the MIG shot down in Mali. But this looks like it was after Le Monde. 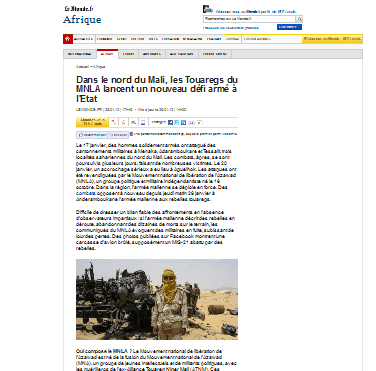 Le Monde has not disclosed who supplied the image and its faked context. Shortly after Le Monde’s story appeared, this influential rebel supporter’s Facebook page showed it reposed. It even appeared — with the Le Monde story– on the blog from which the attributed 2008 photo came. Interestingly, two comments on a Maliweb reprint of the Le Monde story promptly identified it as a burnt truck. They were apparently less newsworthy than a claim in a Facebook post. I have no idea if a Malian MIG was shot down. But claims require proof. And falsified evidence presented as proof seems proof of something else entirely. Here are some examples of this photo’s usage. I assume they should retract its use.